Spearmint is milder than Peppermint and is characterised by an invigorating fragrance that is uplifting and calming. Treasured for its unique minty flavour, and with naturally occurring menthol, carvone, and limonene, Spearmint essential oil can add a cooling effect to foods that is both pleasant and beneficial. With a distinctly sweeter, softer mint taste than Peppermint, Spearmint essential oil is perfect for infusing beverages to help cool you down. Because of its versatility, Spearmint is an important ingredient in Citrus Fresh™ and EndoFlex™. Culinary: Add to recipes for a sweet, minty taste. Add a drop to a glass of fruit-infused water to add variety. 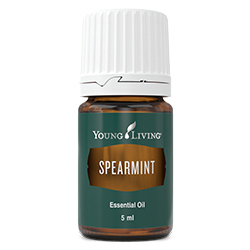 Give meats and veggies a minty note by including Spearmint essential oil in your marinades. Make world-class homemade pesto by adding a drop to your minced basil. Put 3 drops of essential oil onto a cotton ball and clip it to the vent on your air conditioner to keep the room smelling fresh..